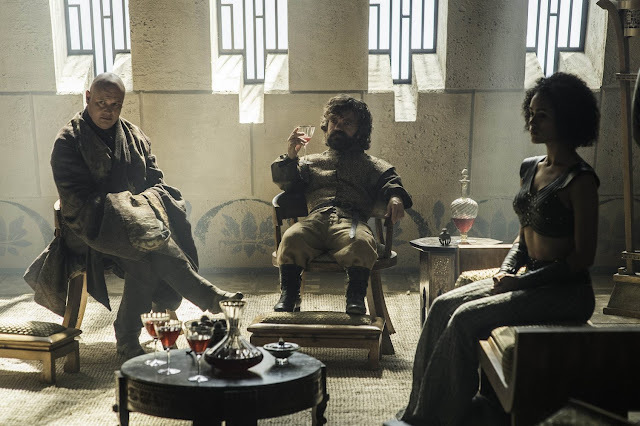 This week's episode of Game of Thrones, Book of the Stranger saw the reunion of three pairs of brothers and sisters, Tyrion drinking and dealing, and Dany cementing her title as the Unburnt. Sansa finally made it to Castle Black! Yay! While they never actually interacted much five years ago, family is family. And when your family numbers are dwindling, you better be happy with who you have left. And it takes Sansa to convince Jon not to quit the fight since there's still a nutjob living in their home with their brother held captive. Unfortunately, even with the Wildlings, they're outnumbered by more than 2 to 1. The other "reunion" to take place at Castle Black was Brienne seeing Davos & Melisandre. With the latter being responsible for Renly's death while under Brienne's protection, and Stannis being executed by her, we've got a bunch of would-be-king killers here. 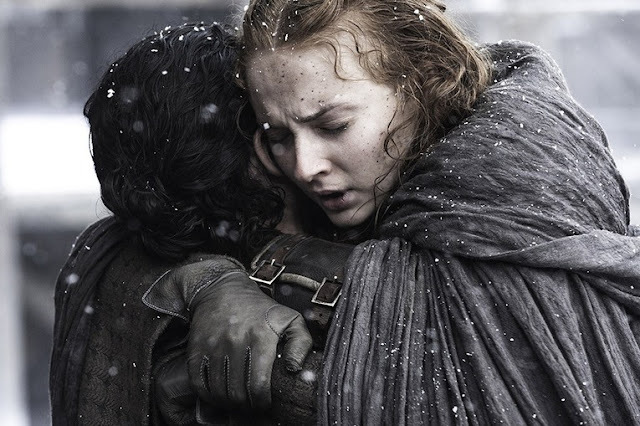 And while Davos and Melisandre may have already moved onto Jon Snow, Brienne doesn't forgive or forget easily. Oh and Tormund and Brienne; that's a thing that has to happen. I don't care if it's just Tormund eating drumsticks in front of her, it has to happen. I can't be the only person who cringes every time Ramsay shows up?!? This time, his victim is Osha, or Tonks from the Harry Potter series. It was a decent plan, one that had worked before. Unfortunately, Ramsay already knew what had happened to Rickon and finished Osha off with his knife, and then calmly resumed eating his apple with the same knife. As if we needed another reason to hate this crazed shitbag. 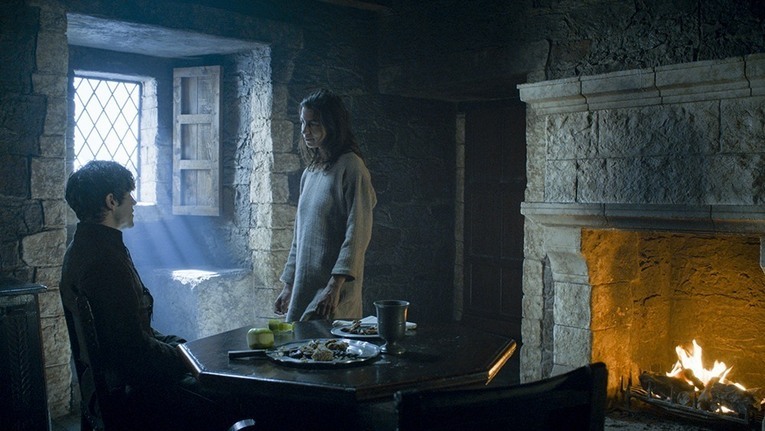 Theon finally made it home to Pyke to find out his father was murdered. He throws his support behind his sister Yara to rule the Iron Islands. Next week, Euron Greyjoy will most likely challenge that. Here's crazed nutjob #2. Tell me you don't see a resemblance between Robin Arryn and the Spleen from Mystery Men? Robin would rather play with birds and watch people fly out the moon door than shoot arrows and rule the Vale. At least he has an adviser in Littlefinger to listen to. Although Littlefinger's plans are always deeply layered to provide him some kind of advantage. His plan is to send troops to the North to help Sansa. With these added troops, Castle Black should be able to defend itself against Ramsay, but I don't think he's is going to be that easy to get rid of. This was the biggest lull in the episode for me. 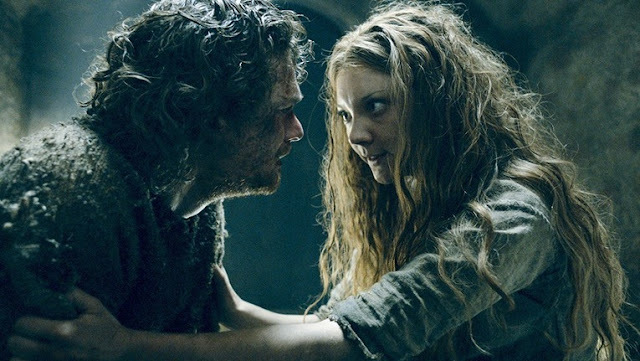 Margaery is still a prisoner but is allowed to see her brother, who I suspect hasn't been seen much because he's busy being Iron Fist. The High Sparrow reveals that he's essentially a born again Christian because he was formerly a womanizing drunk, and now he's a crazy religious fanatic dedicated to helping the poor and shaming women into walking the city naked while garbage is thrown at them. But the Tyrells and the Lannisters aren't having it. After some persuasion, Kevan Lannister, the current Hand of the King, agrees to ask the King to allow the Tyrells to march into the Great Sept to take out the High Sparrow and the Faith Militant. Sure, this won't end badly for anyone. When Dany's away, Tyrion will play... politics. Well it's what he's known for right? That and drinking. Tyrion brokers a deal with the Masters to allow them to slowly abolish slavery over the next seven years in return for stopping their alleged funding of the Sons of the Harpy. Grey Worm and Missandei disagree with the deal, but since Tyrion was a slave for like a day, he totally understands what it's like to be one and guarantees that it's a good deal. Turns out Dany didn't need Daario and Jorah's help anyway. Well, maybe to lock the doors, but Dany made short work of the khals who were deciding what to do with her. She literally burned the house down and just like the end of season 1, emerged unburnt from the inferno. All the remaining Dothraki whose khals have just been burned alive see this and bow before their new Khaleesi. Even Jorah and Daario kneel in awe and reverence. Someone just got her groove back, oh, and a giant Dothraki army too. The Masters are going to have to watch out when Dany comes home. And Tyrion may have to watch out too. And here's the preview for next week's episode titled "The Door."